A market stall at the Byward Market in the City of Ottawa in Ontario, Canada displays maple syrup products in a variety of containers. As one shops around the Byward Market in the city of Ottawa in Ontario, Canada, it is hard to pass by the market stall which displays the containers filled with maple syrup. People from around the world love maple syrup for their pancakes, waffles and french toast and breakfast in Canada would never be the same without it. The maple syrup is sold in various sizes of containers at the Byward Market, smaller ones for people trying it for the first time and large quantities for the ones who can not get enough of it. 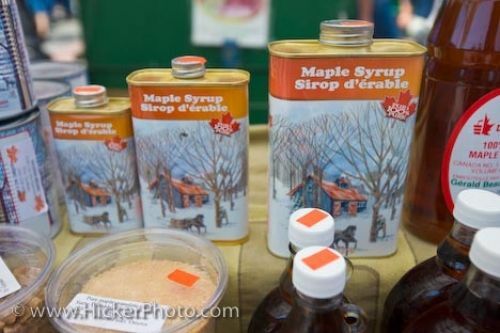 Be sure to sample some of the different kinds of maple syrup while at the Byward Market to ensure that the one you buy at the market stall is exactly what you want. Picture of the various containers of maple syrup at a market stall at the Byward Market in Ottawa City in Ontario, Canada. ... Quebec, Canada makes about 80 percent of the world's maple syrup with Ontario, Nova Scotia, New Brunswick and Prince Edward Island producing smaller amounts. Maple Syrup products at the Byward Market, City of Ottawa, Ontario, Canada.